In the equipment cellar of a true alpinist, you'll be sure to find crampons. Many ice climbers and mountaineers have a full range of crampons at home, which they choose from depending where they will use it. So nothing will go wrong on your dream tour in the mountains. Depending on their use, crampons can basically be distinguished between mountaineering crampons and ice climbing crampons. Of course there is also a number of all-round models, which can be used for both. For mild glacier trekking and ski touring, it is advisable to choose especially lightweight crampons. For ski touring, crampons are often made from lightweight aluminum. For glacier tours, you can choose a steel model, for which ten points is enough. You should also pay attention to the points, these shouldn't be too long as otherwise they will impede walking. For demanding mountaineering and simple ice climbing, a classic 12-point crampon is recommended. For advanced ice climbers there are a whole range of crampons with sophisticated technical details. 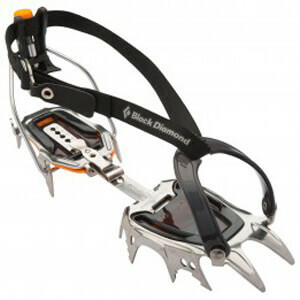 There are crampons with interchangeable or ones which you can quickly change the front points to monopoints. The front points of extreme models are longer, more sharply formed and the remaining points are all designed for use in steep terrain. In severe tours ice climbing shoes are recommended, these are mountaineering boots with points in the sole.